Dice fish filet to 1-cm/0.5-in. thick. (Make sure your fish is fresh, as it will be eaten raw). Place in a bowl. Remove the skin of the bell pepper with a peeler and cut the flesh into a fine dice. Finely slice the scallions (cut diagonally to create prettier rings). Add to the fish and mix well. Chill in the refrigerator. To prepare the marinade, juice the limes into a bowl. Gently deseed the chili and very finely dice. Add to the lime juice, then add sea salt and stir well. Chill in the refrigerator. Wash the mint and cilantro, then remove the leaves and chop. Discard the stalks. Chill leaves in the refrigerator. Now that everything is ready and chilled, it’s time to assemble. Pour the marinade over the fish and mix so that the fish is covered. It should not soak in fully though, as the center of the fish should remain raw. Marinate no longer than 3 min. Then add the herbs, as well as half of the cress. 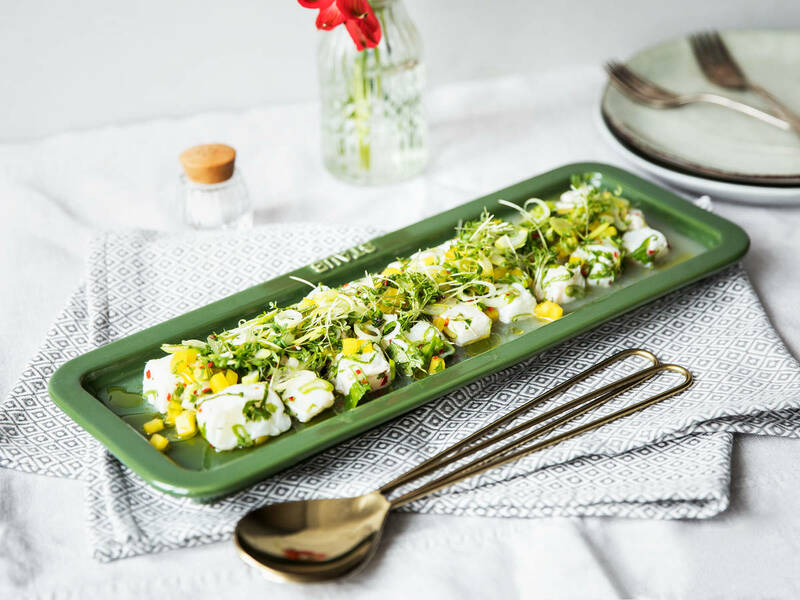 Serve ceviche on a plate and garnish with the remaining cress. At the end, drizzle with olive oil and enjoy!